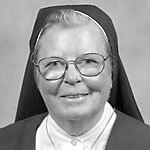 Sister Dorothy Regina Tumulty, I.H.M., formerly Marie Rita Tumulty, died in Camilla Hall Nursing Home on July 28, 2012. She was 81. Sister Dorothy Regina graduated from J.W. Hallahan Catholic Girls’ High School in 1948. She entered the the Sisters, Servants of the Immaculate Heart of Mary from St. Edmond Parish Feb. 2, 1949 and professed first vows Aug. 15, 1951. She received her undergraduate degree from Immaculata College, now Immaculata University, and her master’s in education degree in mathematics from Boston College. Sister Dorothy Regina taught for 56 years in the Archdiocese of Philadelphia. Among her assignments were St. Hubert’s High School (1959-1963), West Catholic Girls High School (1963-1965) and Archbishop Carroll High School (1967-1969). She was assigned to Immaculata College in 1971 and for the next 40 years she served as registrar, academic dean and director of academic advisement until August 2011, when she retired to Camilla Hall and an apostolate of prayer. The funeral Mass was celebrated at Camilla Hall Aug. 1, 2012. Father Christopher Rogers, director of Campus Ministry at Immaculata University, was celebrant and homilist. Interment followed in the Immaculata Cemetery. In addition to her religious community, she is survived by her sisters, Rita Tumulty and Teresa Siman, her sister-in-law, Emma, a niece, nephews, grandnieces and grandnephews. She was predeceased by her parents John and Mary Joyce Tumulty, and four siblings, Joseph, James, Helen Gillin, and Dorothy Tumulty. NEXT: Sister Mary Pasquilina Scannapieco, I.H.M.